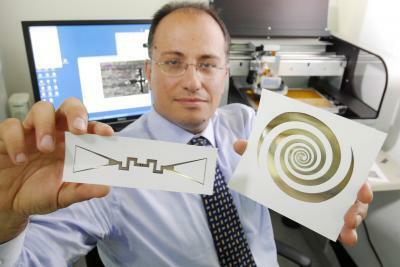 Professor Manos M. Tentzeris von der Georgia Tech School of Electrical and Computer Engineering und sein Team drucken auf Papier oder Kunststoffolien Sensoren – und gleich nebendran Antennen, die die Sensoren mit Energie versorgen. Die Antennen holen die Energie per Energy Harvesting buchstäblich aus der Luft. Energy is everywhere in the environment surrounding us — available in the form of thermal energy, light (solar) energy, wind energy, and mechanical energy. However, the energy from these sources is often found in such minute quantities that it cannot supply adequate power for any viable purpose. In fact, until recently, it has not been possible to capture such energy sufficiently to perform any useful work. This scenario is about to change.